Executive function is a neuropsychological concept referring to the cognitive processes required to plan and direct activities. Skills include task initiation and follow through, working memory, sustained attention, performance monitoring, inhibition of impulses, and goal-directed persistence. While the ground-work for development of these skills occurs before birth, they develop gradually through the first two decades of life. But from the moment that children begin to interact with their environment, adults have expectations for how they will use executive skills to negotiate many of the demands of childhood – from the self-regulation of behaviour required to act responsibly, to the planning and initiation skills required to complete chores and homework. Parents and teachers expect children to use executive skills even though they may little understand what these skills are and how they impact behaviour and school performance. The importance of executive skills to overall cognitive functioning first became apparent in work with children and teenagers who had sustained traumatic brain injuries. Problems involving planning and organization, time management, and memory, as well as weaknesses with inhibition and regulation of emotions, have long described a significant component of traumatic brain injury. Executive skills have also assumed an important role in the explanation of Attention Deficit/Hyperactivity Disorder. This workshop will begin by providing an overview of executive skills, including definitions and a description of the developmental progression of these skills in the first two decades of life. The approach to understanding executive skills presented in this workshop is structured around two key concepts: 1) that most individuals have an executive skills profile that includes both strengths and weaknesses; and 2) by defining executive skills discretely rather than grouping them in broader categories, it is possible to design interventions to address specific deficits that lend themselves to data-based decision making. Workshop participants will gain a deeper understanding both of the model being presented and of their own executive skills profile. The heart of the workshop will address how to assess executive skills and develop interventions designed to address specific executive skill weaknesses. Dr. Peg Dawson: In over 40 years of clinical practice, Dr. Peg Dawson has worked with thousands of children who struggle at home and in school. At the center of their struggles are often weak executive skills. Along with her colleague, Dr. Richard Guare, she has written numerous books on this topic for educators, mental health professionals, and parents, among them Smart but Scattered, Smart but Scattered Teens, Executive Skills in Children and Adolescents, and Coaching Students with Executive Skills Deficits. 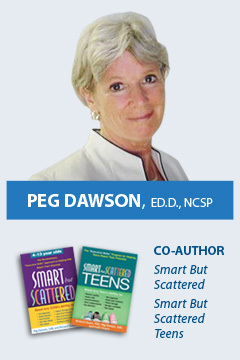 Peg is also a past president of the National Association of School Psychologists, and the International School Psychology Association, and is a recipient of NASP’s Lifetime Achievement Award.